Town boss Nathan Jones revealed he is getting closer to being able to pick from a fully fit squad. Striker Danny Hylton, midfielder Luke Berry, defender Lloyd Jones and goalkeeper Marek Stech all missed the 2-2 draw with Charlton Athletic on Saturday with a variety of ailments. Although only Hylton is in with a realistic shout of being available for tonight’s trip to his former side Oxford United, Jones thinks the rest will be back soon. He said: “We’re close, we’re only probably two and a half, three weeks from a full squad now, providing no-one else gets injured. “The ones who have been out and the ones who are close, are far, far closer, so we’ve got a few decisions to make on those. “We’re a lot stronger now which I’m pleased with. “Lloyd is probably the furthest away, he’s probably a couple of weeks away, him and Berry will be a tight one which gets back first. 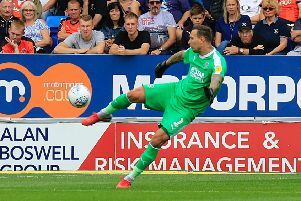 Jones also confirmed that Stech has undergone his hernia operation and is now working his way back, adding: “That’s all done and he’s nearly two weeks post op, which depending how strong you are, two weeks you’re back in training.